Find Volkswagen Hire Companies here. Wish to Hire a VW Campervan? Try Flamenco Campers VW Hire. Browse our list of Advertisers. Check out allCool VW Hire. Ask about Caracolvan VW Hire. Need a VW Wedding hire? Be sure to visit our Campervan Friendly Campsites resource page on facebook. For your benefit, we actively encourage campsites around the UK and throughout Europe which are happy to have campervans stay with them. If you cannot find a campsite for the area you intend to visit, simply post questions in the group. Thanks for visiting and keep checking our website for more information. Browse our list of VW Hire companies advertised on our webiste. 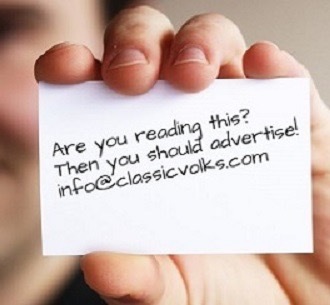 Email your chosen hire company directly or if you can't find the right hire option, simply email classic volks and let us do the searching for you. New Horizon Camper Van Hire We are based in the market town of Altrincham. We are close Manchester City Centre and Manchester Airport. Our aim is to ensure you have an amazing time exploring the places that make Britain great in one of our iconic VW Campers. We have modern and classic VW campers available and a wide range of additional equipment to hire. Based in Cheshire you can find lots of fabulous places within two hours drive of our pick-up location. The Peak District, North Wales, The Northwest Coast, The Lakes and Yorkshire are all close by and all have something different to offer. If you have a question, want to make a booking, here is what you need to know on doing so. You can call on: 0161 980 7743 or head over to the New Horizon Camper Van Hire website for more contact details by this link. 69 Campers, South of France. 69 Campers brings you bespoke 1960's and 70's VW camper vans for touring across the Cote d'Azur. We're open 8am-10pm every day, answering your enquiries and taking bookings. Whether you are looking for a holiday or a short break, a wedding or a special occasion, we can cater for all your requirements. Margot, Gigi and Am�lie welcome you to 69 Campers, go your own way! See the wonderful hilltop towns of fragrant Provence, chic resorts of St-Tropez, Cannes, Nice and the principality of Monaco offer hidden gems and retreats. Go your own way and explore an area steeped in history and natural beauty. Would you like to book with 69 Campers? 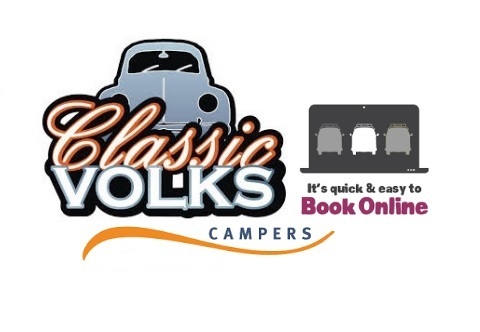 Simply use this link to see Our full booking details webpage here on ClassicVolks.com We are open 8am-10pm, Everyday Telephone: 0033 483 11 17 75 or email info@69campers.com. Caracolvan... offers a different way to discover Andalusia and enjoy your holiday with complete freedom of movement and in full contact with nature. Come on, hire a Campervan (compact motor home) with us and see. We can offer you a classic model VWs T2 & California and /or a modern Camper fully equipped with the amenities of a current vehicle. We are located in Cadiz, in southern Andalusia, Spain. On one of the coasts with the most unspoiled beaches in Spain and with many Natural Parks. We are only 100 km from Seville and 100 km from Tarifa. You can reach us by plane via Jerez Airport or by train from Madrid in just three hours. We can also arrange delivery via Seville Airport; available by request. 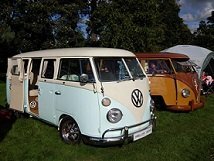 Click here for Caracolvan VW Camper hire booking details. 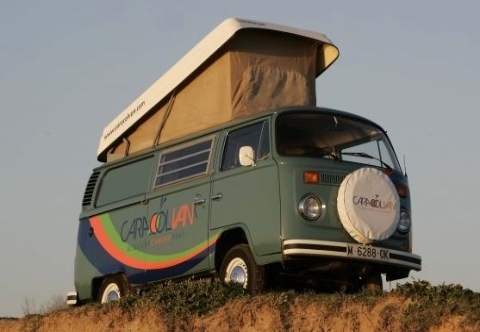 Would you like to book with Caracolvan? Simply use this link to see Our full booking details webpage here on ClassicVolks.com Email Caracolvan via: info@caracolvan.com or call them directly on: +34 956 562809 to check availability and make bookings. 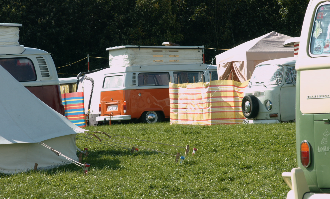 Comfy Campers... VW Camper Van Hire from Comfy Campers. 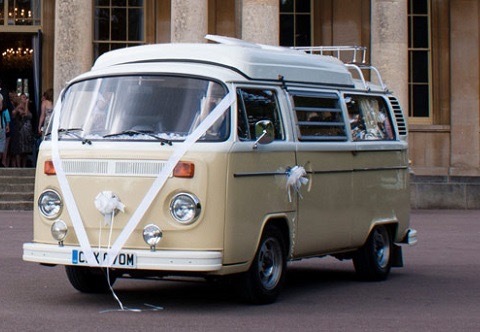 Classic VW Campervan hire from the Cheltenham, Gloucestershire to anywhere in the UK. Hire a V W Campervan that is 100 percent original and it will provide you with an unforgettable holiday experience. Hire a Volkswagen campervan for holidays, music festivals, weddings, proms, parties, special occasions and corporate events. Whatever the occasion we have 4 beautifully restored right hand drive VW campervans for hire throughout the UK. We are members of the Camping and Caravanning Club and offer fully comprehensive insurance, unlimited UK miles and AA breakdown cover. The campervan comes fully equipped with everything you require for a VW campervan holiday. 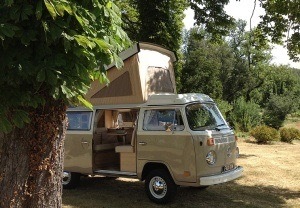 Click here for booking details for Comfy Campers VW Hire. Would you like to book with Comfy Campers? Simply use this link to see Our full booking details webpage here on ClassicVolks.com Email ComfyCampers via: info@comfycampers.co.uk or call them directly on: 01242 681199 | 07793 530812 to check availability and make bookings. 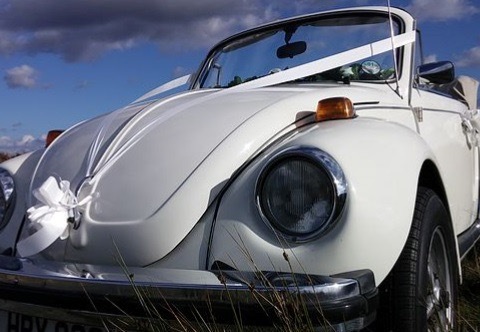 Dorset Dub hire... Dorset Dubhire specialise in chauffeur driven classic VW wedding hire for your wedding day or civil ceremony. 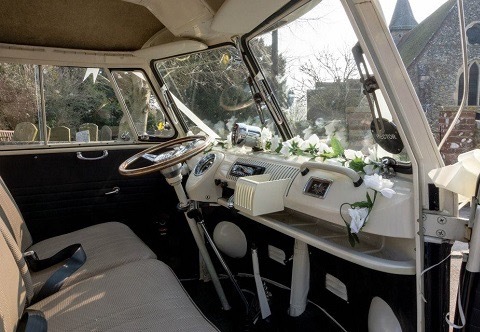 Our beautifully restored wedding buses, Lulu and Lottie are the perfect way to travel and arrive in vintage style and can seat up to 6 people. Choose from our baby blue over ivory 1960 split screen Lulu and our 1970 lotus white bay window Lottie or hire both together for a real statement. Both vehicles have been lovingly converted and benefit from bespoke interiors to ensure maximum space and comfort. 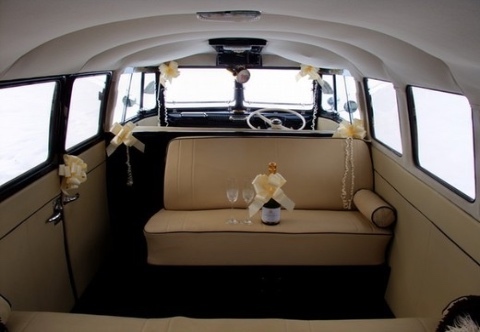 Our wedding transport packages include ribbons, floral garlands and bunting and a complimentary bottle of champagne. Contact us for an obligation free quote or to discuss your requirements. Would you like to book with Dorset Dubhire? 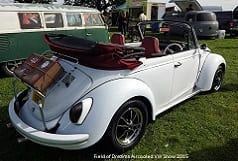 Simply use this link to see Our full booking details webpage here on ClassicVolks.com or call them directly on: 01202 848857 to check availability and make bookings. Dunrunnin CamperVan Hire... Dunrunnin provides fully refurbished and bespoke Volkswagen campers for holiday hire and wedding transport. We are a small family run business working from home, based in the island town of Enniskillen, which lies on the shores of Lough Erne, County Fermanagh, N.Ireland. Our location is ideally situated for unfettered access to all that the North and South of Ireland has to offer. What sets us apart from most other companies is that we do not charge extra for pillows, sleeping bags, bike rack, taking your dog, additional tent, child cab bunk, outdoor table and chairs. here to go to our website. You can use this link to visit Dunrunnin Campervan hire website directly and make your booking. Click here for booking details for Dunrunnin CamperVan Hire. Would you like to book with Dunrunnin Campervan hire? Simply use this link to visit Dunrunning Campervan hire website or call them directly on: +44 7966 798155 to check availability and make bookings. Flamenco Campers... Have you ever thought of exploring Andalusia in a campervan? 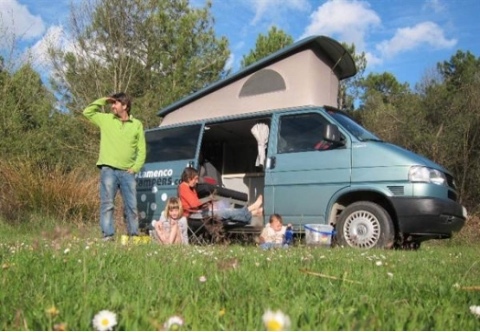 Flamenco Campers is a young family business born with an adventurous and travel-oriented spirit. We are camper lovers and we bought our first campervan on november 2003. 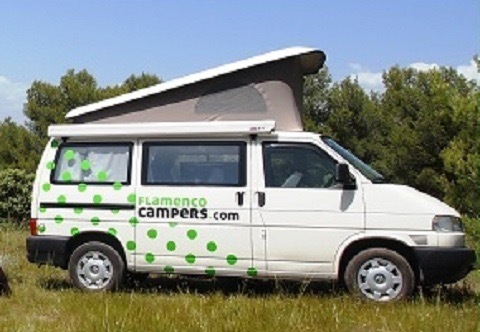 Flamenco Campers gives you the chance to hire a camper and explore Andalusia. Why not to take a cheap flight to Malaga and travel around Andalusia in an amusing spotted campervan? We want to give you the very best so that you can enjoy the camper experience and make each day of your holiday a new, different and unforgettable adventure. Would you like to book with Flamenco Campers? 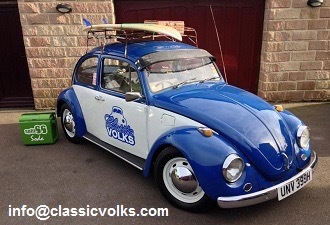 Simply use this link to see Our full booking details webpage here on ClassicVolks.com or call them directly on: (+34) 951 701 291 to check availability and make bookings. Go with the Flo. 'Go with the Flo' is all about having a holiday in a totally different, fun and exciting way When you hire Flo, enjoy unlimited miles to explore our beautiful island on the open road. Everything you need is included in the van, from insurance to maps, roadside breakdown cover and all kitchen utensils and equipment. In fact, you'll need nothing apart from bedding and clothes. Flo is also available for weddings, proms and TV work. 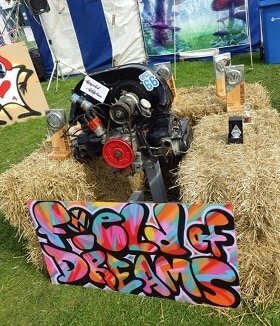 Based in Suffolk, Flo is ideal for touring the Norfolk coast and is available for the Latitude Festival. hire 10. Slow down, you move too fast!If you are looking for a different type of holiday or break that matches your individual style or just need time to relax and experience a slower more chilled lifestyle, then why not hire a classic camper from allCool? Hiring one of our campers gives you the chance to see the country, experience freedom and enjoy a relaxing, fun time for all the family. Are you getting married? Do campers 'float your boat' or that of your partner? Why not arrive in unique style on your special day? Rose our beautiful 1965 VW split screen Camper Van is the perfect choice if you have a chic, retro style combined with a sense of fun and flair. VanGo Durango... Slow down, you move too fast!If you are looking for a different type of holiday or break that matches your individual style or just need time to relax and experience a slower more chilled lifestyle, then why not hire a classic camper from allCool? Hiring one of our campers gives you the chance to see the country, experience freedom and enjoy a relaxing, fun time for all the family. Are you getting married? Do campers 'float your boat' or that of your partner? To contact VanGo Durango directly, simply visit VanGo Durango website or send them an email to: vangodurangollc@gmail.com Their telephone number is: 970-903-9136 (USA based company). Want to Advertise on our vw hire page? We have a range of advertising options to suit your budget. We love the Andalucia area of Spain, why not grab a camper and explore the area? 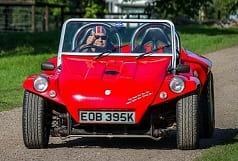 There are so many places still to see in the UK and some great camping spots plus hire comapnies galore! Have you travelled around the beautiful countryside of France? Why not hire a campervan and try it! The grass really is greener on the other side if the other side is Ireland! Jump in a campervan and see for yourself! The USA is a big place to explore, a campervan could well be the perfect way to drive Route 66!. Where can I camp for free in the UK? Strictly, all land in England and Wales is owned so you must gain permission before camping. However, wild camping within reasonable limits is often tolerated in many upland and remote areas, particularly in Snowdonia and the Lake District. Know a free camping pub, land, location? Send us an email so that we can share it with others. By using many various social media outlets, we get a chance to let what is an ever increasing huge number of like minded vw enthusiast. We'll be sure to pass on any special offer hire packages or prices we discover. 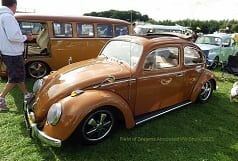 We regularly share and Re-Tweet related vw posts with thousands of our followers and friends. 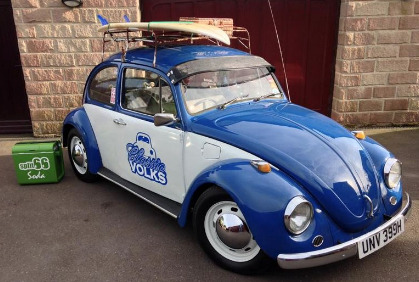 Say hi to us at: @Classicvolks - looking forward to hearing from you. Through Twitter we can create a network of contacts. Before you know it, a nice little group of people with common interests strike up genuine conversations. Quick Tweet: @Classicvolks Same great venue. Here we go everyone. year 5!